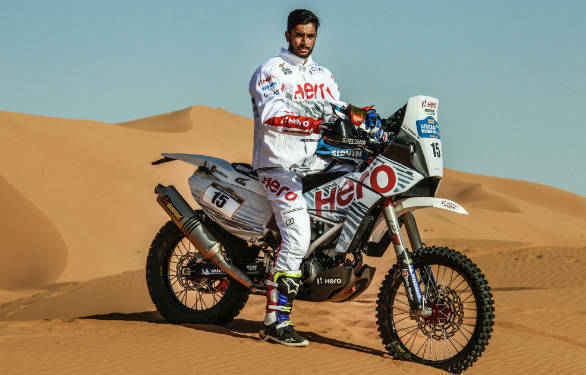 Hero Motosport Team Rally, the motorsport arm of India's biggest motorcycle manufacturer, Hero Motocorp have also announced their participation in the India Baja 2018. The team's won this event last year in there first ever outing here. Last year's charge was led by rider Joaquim Rodrigues was also crowned the winner of the event. But he has been out of action for the better part of this year due to an injury he sustained during the Dakar Rally. CS Santosh will replace him this year at India Baja. He comes on the back of a strong performance at this year's BAJA Aregon in Spain where he finished 9th in his class. He will be piloting hid Hero 450 RR in this event as well. The third edition of the India Baja off-road motorsport event will be held in the deserts around Jaisalmer, Rajasthan, between August 17 and 19. Participants in the event will compete in Baja format rallies covering over 400 km of Special Stages and 150+ km of Transport Stages, covering some challenging off-road terrain in the Thar desert. Contenders are expected to battle temperatures higher than 50 degrees Celsius during the course of the rally.